It is rare in boxing that a great fighter produces a great fighter for a son. Marvis Fraizer was a fringe contender, his name putting him in world title fights he hardly deserved. Julio Cesar Chavez Jr. cracks some pound-for-pound, top 10 lists. His son was humped along into ersatz world-title status, with a couple of dubious decision victories to maintain his perfect record at the prospect level. He had his father’s chin and something of his power, but when he fought the true middleweight champion, the undersized Sergio Martinez, he served himself up as a human punching bag. Chris Eubanks Sr. was one of the bigger British boxing stars of the 1990s. He stopped domestic rival Nigel Benn in 1991, in a battle for the WBO middleweight title. They fought to a draw in the 1993 rematch, with the WBO super middleweight title at stake. Those were some of the biggest fights in England during the decade. 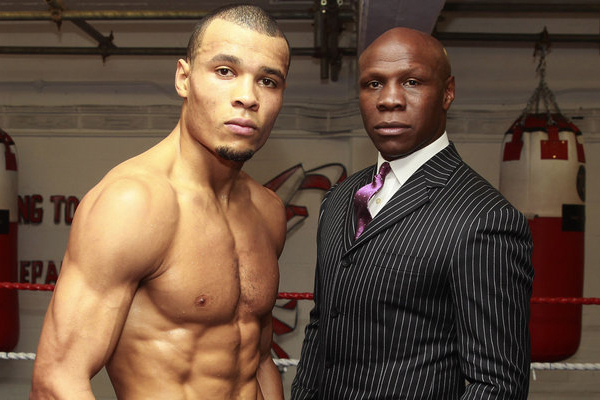 Eubanks Jr. has yet to reach his own father’s level of success. At middleweight, he lost a split decision to current WBO trinket holder Billy Joe Saunders in November 2014, but rebounded to pick up a solid win over Dimitri Chudinov via Round 12 TKO. He was a legit contender at middleweight, but his camp made such ridiculous demands for a fight with Gennady Golovkin that they were laughed away from the table. Now, after failing to raise his status as a middleweight during 2016, he is moving to 168 pounds. Eubanks is facing 11-1 Renold Quinlan for something called the IBO super middleweight title. This article from the Daily Mirror has the audacity to refer to this trinket as the “world title.” It grieves me I do not have a larger readership than the Mirror, for they are spreading a confused and misinformed view of boxing reality that badly needs to be counter-balanced. What this fight represents is Eubanks testing the water at a higher weight class, perhaps speculating that an alphabet-soup title will be easier to come by in a division that does not include Gennady Golovkin.